TRUCKEE, Calif.— May 1, 2017 — Martis Camp, a private residential golf and ski community in North Lake Tahoe, recently closed on the sale of its final developer homesite, a record feat achieved in just over 10 years since launching sales in 2006. With the sellout of all 671 homesites, the next phase for the master-planned community will focus on resale product under the direction of Martis Camp Realty, Inc., the leader in real estate sales at Martis Camp. 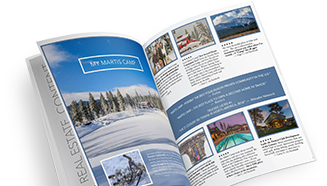 The Martis Camp Realty team has generated more than 900 transactions and exceeded $1.5 billion in sales over the last decade. Looking ahead, the onsite brokerage will maintain an exclusive focus on the robust resale market at Martis Camp, which set records in 2016 with 49 resale homes, 33 resale homesites and 26 developer homesites sold for over $255 million in volume. Currently, there are 32 custom homes and 35 homesites offered for sale. Widely considered the ultimate year-round family retreat, Martis Camp sets the industry standard in private club amenities by offering one of the most comprehensive four-season experiences in the country. This includes private ski lift access to Northstar California, an award-winning Tom Fazio golf course, water activities at the Beach Shack on Lake Tahoe, a full-service spa with men’s and women’s lounges, a Family Barn complete with a bowling alley, swimming pool, movie theatre and soda fountain, as well as convenient access to Tahoe’s abundant outdoor activities. Additionally, a full calendar of events benefits the whole family; from movie nights at the Family Barn, to wine mixers, holiday dinners and a summer concert series, there’s something for everyone to enjoy at the Camp. For more information on Martis Camp and Martis Camp Realty, please visit www.MartisCamp.com or call 1-800-721-9005. Martis Camp is a private gated community located between Truckee and North Lake Tahoe in the Martis Valley. Situated on 2,177 acres with sweeping topography, the land itself embraces the true essence of High Sierra living. A year round community, Martis Camp Club offers private ski access via the Lookout Lodge and Martis Camp Express Lift to Northstar California™ in winter and a Tom Fazio 18-hole golf course in the summer. Martis Camp Club members enjoy a vast array of amenities including the Family Barn complex with swimming, a bowling alley, art loft, movie theater, indoor basketball court, soda fountain and outdoor performance amphitheater; an 18-hole putting park; Sporting fields and pavilions; Camp Lodge with dining venues, club day spa and fitness center and vitality pools; Folk School; Lost Library; 26 miles of private trails for hiking, snowshoeing and cross-country skiing and a private mountain clubhouse at the base of Lookout Mountain. next post: Truckee Thursdays. A brilliant scene in a colorful town.